Listowel Emmets is deeply saddened by the death of John McMahon on Saturday last 21st April. John had served many positions within the GAA not alone in Listowel but also within in the County and was, up until his death Vice President of the Emmets C.L.G. Any of us that grow up in Kerry, have football running through our veins its part of our anatomy, consuming our thoughts, shaping our character and for John McMahon although a native of Limerick, this was certainly the case. He made Listowel his home when he moved there to become a bank manager for the Bank of Ireland in the town. He became keenly involved in the GAA, and in particular Emmets bord na nÓg in the early 80's and was secretary of the club in the early 90s. He was ever present, coaxing, and encouraging from the time they first donned the jersey’s of Listowel Emmets. 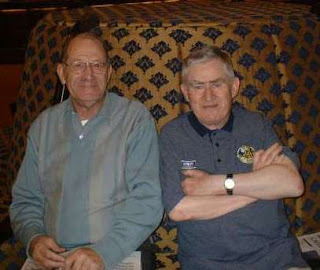 John served as County Board Treasurer for a staggering 25 years from 1985 -2008, (during this time he shared the job with Jimmy Coffey (R.I.P) pictured with John on the left hand side during a Congress meeting in 2002) John's kindness and friendly disposition endered him to all, and alway made his job that bit easier! The position of treasurer brought with it, many obstacles and the need to raise funds were always to the fore. John is credited as one of the forerunners in organising the Annual Scheme tickets in the county - whereby patrons purchase an annual subscription to avail of stand tickets for the Senior Intercounty games. John's love for gaelic games and his respect for all those who played the game is reflected in his hard work and dedication to ensure these players were looked after. He undoubtedly loved his time involved with the County Board and remained up until his death a close advisor to us all in Emmets. To us in Emmets he is irreplaceable. Having spent time in his presence you would come away enriched, energised and happy in the knowledge that here was a man who was very special. One of those people you might be fortunate to meet once in a life time. To John's eight children, Mary, Paul, Anne, Sean, Aida, Caroline, Janet and Amy we extend our deepest sympathies. Solas na bhFlaitheas ar a anam uasal.